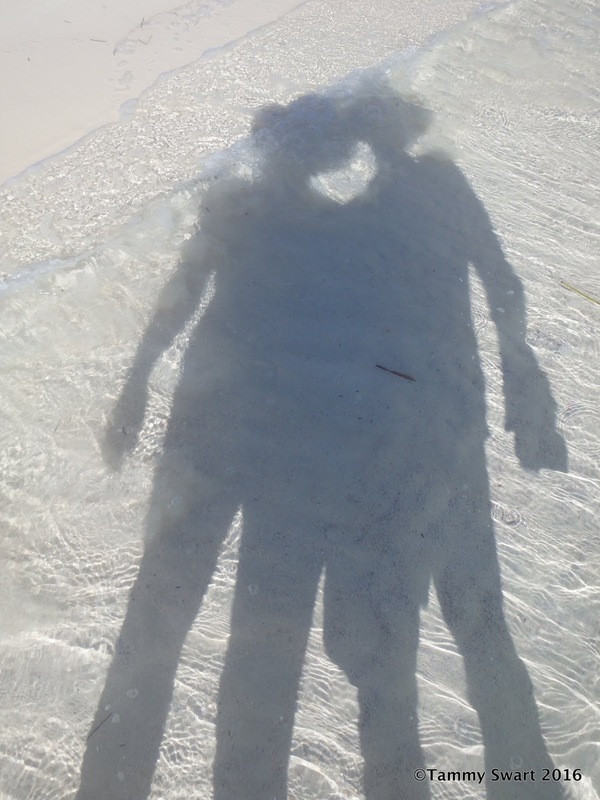 We are unreasonably ecstatic to be back here in Elizabeth Harbour, Georgetown, Exuma. We spent weeks here earlier this year and, frankly were ready to leave... but coming back, all of that is gone and we're determined to do the things we missed last time. High winds kept us from enjoying much of what this spot has to offer. There are hiking trails and nearby snorkel spots galore... not to mention beaches. Upon arrival we dropped the hook at the first beach we came to. Monument Beach. Actually we are almost between two beaches as we are closer to the gorgeous Flip Flop beach than Monument. But we wanted to be away from the crowds so that running our generator in the evening didn't bother anyone. 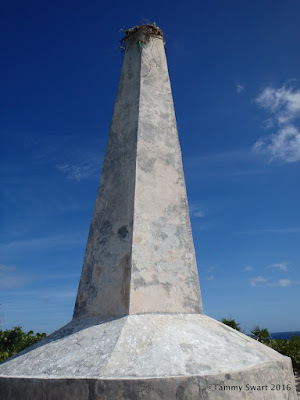 The first item on our agenda for our first full day here was to find and conquer the trail to the top of Monument hill. 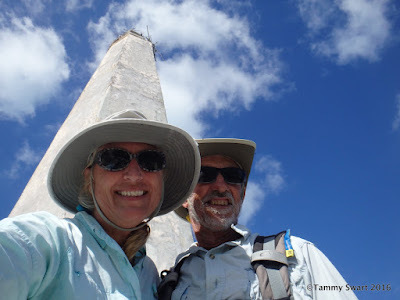 We dressed in our hiking gear, rugged shoes and sturdy, sun protective clothes and hats and headed for the Queen's Dock. We followed the well-worn clearing into the tropical brush and into literally CLOUDS of mosquitos! It had briefly crossed my mind to pick up a bottle of my DIY Insect Repellant, but it was gone before I made it happen... Now I'm wishing that I had picked it up because WE were almost picked up by these hungry mozzies! The path lead gently up until near the end when it became a little less sandy and a lot more rocky. There was a rope secured to the rock to help climbers up a particularly steep spot, and the rocks looked like steps had actually been carved for us... left, right, left, right. My breath became labored as I ascended the last part. Remember, we spend a LOT of time within the confines of a 45 ft. boat. To say that we are out of shape would be an understatement. But the view from the top is reason enough to risk a heart attack and we were rewarded as we turned around and took a breath. If the climb didn't take my breath away... the view totally did! A few more steps and we were at the monument. 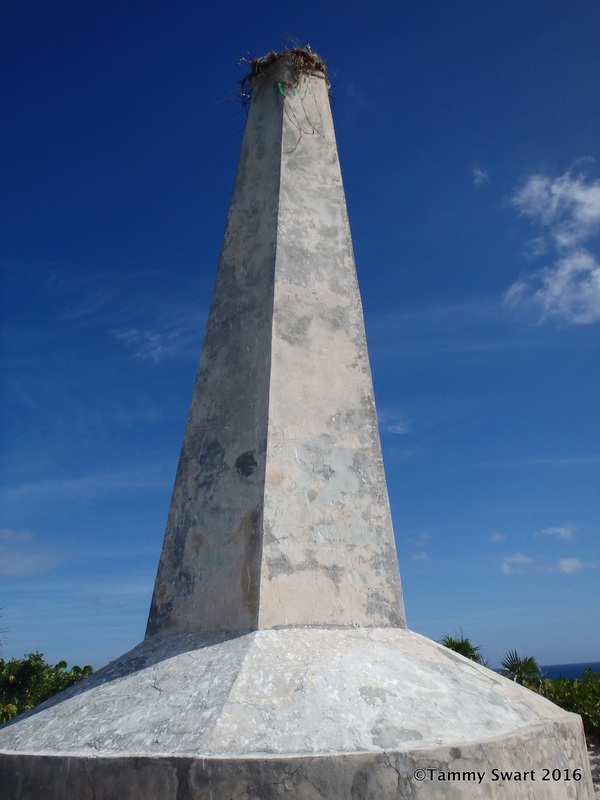 I've looked and looked for a history of this structure, sometimes called the Salt Beacon. All I can find is that it once had a light at the top and served to guide ships into Elizabeth Harbour associated with the Salt Trade. Now it provides that same service to Cruisers and it is a welcome sight signifying that we're almost there as we sail down the coast. It also provides a convenient nesting spot for this curious Osprey. She seemed very interested in our activities as we approached and I wondered if she had eggs or babies in her nest. Her mate did a fly-by earlier when we were docking the dinghy down at the Queen's Dock, kind of a warning to discourage our approach. Didn't work. 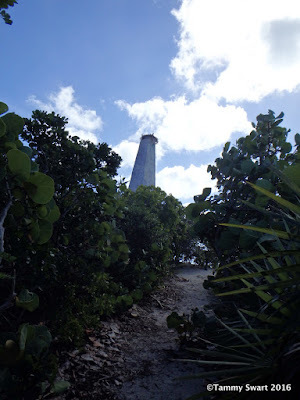 Our plan had been to continue on the path to the beach on the Exuma Sound side of the island but the mozzies chased us back out to the water. Maybe we'll come back and hike another day armed with repellant... today I'm wearing the blood of others on my clothes as we high tail it to the boat for lunch. It is warm and the white sands are calling. And I still had to get my New Year's sand card done, although it's kind of lame because the waves just kept coming and coming!!! We walked all the way to the other end of the beach. The sand is exquisitely soft here and stark white, which upon closer inspection contains grains of rose/pink coral. It's very fluffy making it difficult for walking but good exercise. (that's my story and I'm sticking to it). As the sun began to set, we turned back to retrace our steps and saw that we have more friends arriving. Magnolia was just settling in and we dinghied over to say hello. They told us that Kelley Nicole and Agape V were on their way. Another meeting of the Morgans was soon under way. We invited everyone over to our boat and hosted the first official GT-get-this-party-started event. It was supposed to be a short one but lasted until well into the night. It was fun having the boat full to overflowing (10 souls) and I'm sure our laughter could be heard across the harbour. Good times abound. Each day unfolds with new friends and sights. Cruising life is good and we're so glad we persevered through all the work days because now... the Play Days begin!